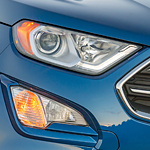 As one of the fastest growing segments in the automobile industry, the compact crossover is winning over drivers for its sleek styling, impressive performance, and value-driven properties. The friendly associates at Ford of West Covina invite you to stop by and let us show you why the Ford EcoSport is an exceptional choice for all of your automotive needs. The available 8-inch touchscreen of the Ford EcoSport keeps you connected at all times on the road. This screen works like a smartphone, allowing drivers and passengers to swipe, pinch, and zoom in to access a variety of functions. From music to navigation services to communication capabilities, this touchscreen will ensure that you have everything that you need for a convenient ride. The EcoSport SE, SES, and Titanium trims come equipped with a power moonroof, designed to bring the beauty and brightness of the great outdoors into the spacious cabin of the Ford EcoSport.